Charles Loloma was a Hopi artist who started designing and crafting jewelry in the late 1950s. Loloma is mainly known for his multi-inlaid designs but as depicted in this image of this 14k gold ring with Landers Turquoise he used only a single stone. 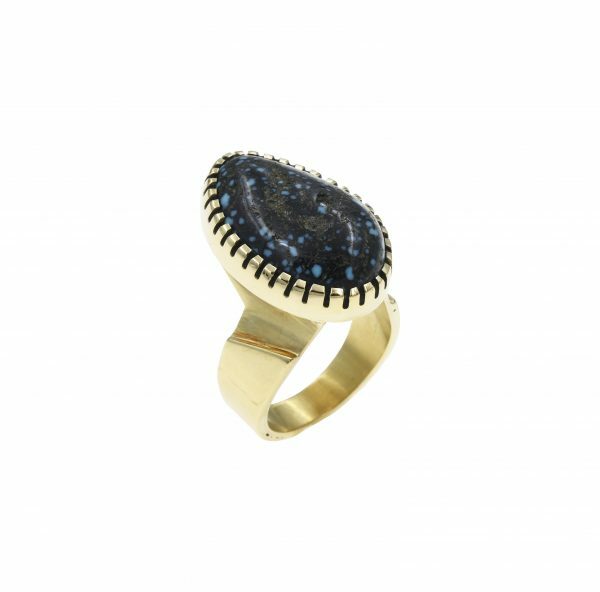 This ring was designed is this classic ring with a single stone setting which Charles engineered to lock on the figure using the weight of the stone to keep the ring in place on the wearer’s finger. This ring was finished around the late 1970s and early 1980s. Landers Turquoise was very limited in supply found in Nevada. This ring is a size 6 1/2 and can be sized.